SAN DIEGO, CA—(Marketwired – Dec 12, 2014) – Fashion icon and television personality Giuliana Rancic announces her favorite holiday gifting and entertainment obsessions from e–commerce brands ProFlowers®, Personal Creations® and Shari's Berries®. A portion of proceeds earned from Giuliana's gift selections sold on the brand sites will benefit Fab–U–Wish, an initiative she established in partnership with The Pink Agenda to help women undergoing breast cancer treatment feel fabulous. Giuliana personally chose her favorite picks for this holiday season: ProFlowers Trio of White Christmas Candle Rings, Shari's Berries Cake Truffles with the S'Mores Cake Truffles as her personal favorite, and a Wood Cutting Board personalized with “The Rancic Family” from Personal Creations. The Trio of White Christmas Candle Rings is part of ProFlowers' new White Christmas Collection, a new home décor line that incorporates fresh greenery and floral centerpieces. The combination of assorted pine sprigs and glittered pine cones is an elegant complement to Giuliana's modern, chic flair, and a festive addition for holidays at her home in Chicago. ProFlowers offers six other holiday home décor collections that make special, unique and impactful holiday gifts or ambience for holiday tablescapes or hostess gifts. As a busy mom, Giuliana is always on the lookout for gourmet sweets to gift and serve at holiday parties, and her favorite this holiday season is Shari's Berries' new Cake Truffles, a bite–sized decadent cake, reinvented and dipped for extra holiday indulgence. Giuliana's personal favorite from the many new flavors of Cake Truffles is the S'Mores Cake Truffles. She loves sending the truffles to friends, family and co–workers, since it comes in a beautiful gift box and offers fun, uplifting messages with every bite. Shari's Berries is famous for its decadent, gourmet–dipped berries and treats. There's nothing Giuliana values more than family and spending time at home with her son, Duke, and husband, Bill, especially if it's in the kitchen. Giuliana's favorite from Personal Creations, the Personalized Wood Cutting Board, is a great gifting option for friends and family, especially since it is personalized. Personal Creations is an online retailer that specializes in providing unique, one–of–a–kind gifts for the entire family. A portion of proceeds earned from Giuliana's favorite holiday selections will be donated to Fab–U–Wish. A breast cancer survivor herself, Giuliana created Fab–U–Wish. ProFlowers, Shari's Berries and Personal Creations have a long history of supporting the breast cancer cause and have contributed more than $1 million to the cause through its family of companies. Giuliana's top gift selections from each brand can viewed and purchased at www.berries.com/giuliana, www.personalcreations.com/giuliana and www.proflowers.com/giuliana. DULLES, VA—(Marketwired – Dec 12, 2014) – Standard & Poor's Ratings Services (S&P) has revised its Issue Credit Ratings methodology for nonbank financial institutions (NBFIs), resulting in a change in the rating of senior secured debt issued by the National Rural Utilities Cooperative Finance Corporation (CFC) from A+ to A. S&P affirmed its issuer credit rating of CFC at A with a change in outlook to “negative” based on its revised rating methodology for NBFIs. The revised Issue Credit Ratings methodology equalizes senior secured debt issued by all investment–grade NBFIs at the same level as the issuer credit rating. The change only affects CFC's senior secured debt; CFC's corporate and short–term credit ratings remain unchanged. Moody's Investors Service's (Moody's) assessment of CFC remains unchanged. On Nov. 24, 2014, Moody's reaffirmed CFC's senior secured debt rating of A1, senior unsecured debt rating of A2, subordinate debt rating of A3 and short–term rating of P–1 with a stable outlook. CFC's most recently reported financial results for the quarter ended Aug. 31, 2014, are available on the CFC website and as filed with the U.S. Securities and Exchange Commission. This press release contains forward–looking statements, which are based on certain assumptions and describe our future plans, strategies and expectations, and are generally identified by our use of words such as “intend,” “plan,” “may,” “should,” “will,” “project,” “estimate,” “anticipate,” “believe,” “expect,” “continue,” “potential,” “opportunity” and similar expressions, whether in the negative or affirmative. All statements about future expectations or projections are forward–looking statements. Although we believe that the expectations reflected in our forward–looking statements are based on reasonable assumptions, actual results and performance could materially differ. Factors that could cause future results to vary from current expectations are included in our annual and quarterly periodic reports previously filed with the U.S. Securities and Exchange Commission. Except as required by law, we undertake no obligation to update or publicly release any revisions to forward–looking statements to reflect events, circumstances or changes in expectations after the date on which the statement is made. The National Rural Utilities Cooperative Finance Corporation (CFC) is a nonprofit finance cooperative created and owned by America's electric cooperative network. With more than $22 billion in assets, CFC is committed to providing unparalleled industry expertise, flexibility and responsiveness to serve the needs of our member–owners. CFC is an equal opportunity provider and employer. Visit us online at www.nrucfc.coop. NEW YORK, NY—(Marketwired – Dec 12, 2014) – As New York's only revolving rooftop restaurant and lounge, The View is understandably a showpiece of New York Marriott Marquis. But just like great museums where visitors appreciate artworks more when they know a little bit about them, the view from The View becomes profoundly more impactful when guests can identify the landmarks on the horizon. To that end, this NYC hotel is launching a new infographic whose details about the surrounding buildings do more than just inform. They also inspire guests to add their own bird's–eye view to the social–media conversation at #ViewFromTheView. Guests sitting down to dinner at The View find themselves in an entirely new stratosphere. Not only is the restaurant yet another stunning feature of one of the most impressive hotels in Times Square, but it feels as enlightening as it does awe–inspiring, thanks to the new infographic. As a result, visitors might peruse the options for the three–course, prix–fixe menu while they search out landmarks like the Empire State Building, the Rockefeller Center and the Chrysler Building. As they deliberate between foie–gras parfait and baby octopus, they might notice how Carnegie Tower was built with the same palette of materials as those used in the neighboring Carnegie Hall. And as they tuck into a roasted saddle of lamb or the pan–roasted salmon, they can imagine joining the glittering ranks of celebrities who've docked at the Passenger Ship Terminal, or debate which of the New York Times' seven different headquarters over the years has been its finest. Dessert, whether it's artisan cheeses or chocolate–and–raspberry tart, is the perfect time to gaze upon the famous New Year's Eve ball, which rests atop One Times Square when it's not descending down to cheering crowds. Guests are also encouraged to snap a few photos of their favorite views and post them to social channels with the hashtag, #ViewFromTheView. Whether people prefer to gaze upon the World Wide Plaza (whose rooftop pyramid is invisible from the street), Columbia University's symbolic carvings or the country's first green skyscraper, 4 Times Square, they can all likely agree on one thing: The View is just one more way the New York Marriott Marquis rises above other hotels in NYC, both literally and metaphorically. Ideally located in the center of New York City's bustling Times Square, the New York Marriott Marquis is a sophisticated and contemporary hotel. The updated rooms and suites are outfitted with marble bathrooms; LCD TVs with cable and premium movie channels; large work desks with ergonomic chairs; enhanced high–speed, wireless Internet access; and sweeping views of Times Square and the New York City skyline. 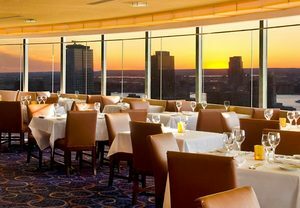 There are three restaurants and lounges on–site including The View, NYC's only revolving rooftop restaurant; the renovated Broadway Lounge; and Crossroads American Kitchen & Bar. With 55 meeting rooms, an elegant ballroom that can accommodate up to 2,800 people and over 100,000 square feet of meeting space, the hotel is the venue of choice for meetings and events in Manhattan. The New York Marriott Marquis is also just minutes from New York's most famous attractions, including Radio City Music Hall, Central Park, Carnegie Hall, Lincoln Center, UN headquarters and Madison Square Garden, making it one of the most convenient and impressive options among NYC hotels. 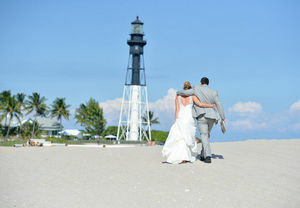 POMPANO BEACH, FL—(Marketwired – Dec 12, 2014) – Newly–engaged couples looking to say “I Do” with the Atlantic Ocean as their witness are in luck this winter, with the Fort Lauderdale Marriott Pompano Beach Resort & Spa announcing its new wedding packages for the upcoming season. Couples who book their special day early, before January 31, 2015 will get access to a host of exclusive perks and discounts, including complimentary suites, a champagne toast, spa treatments, a one–night's stay for their first anniversary and waived event rental fees. With unique oceanfront event spaces, elegant dining options and Certified Wedding Planners, the iconic beachfront hotel, set along the shores of Pompano Beach, is one of the region's most popular destinations for couples embarking on their new journey together. Its Atlantic Ocean views provide the perfect backdrop for a ceremony in the sand, or a reception by the shore. The resort's first wedding package, for bookings of $10,000, includes a complimentary Oceanfront Bridal Suite, two 50–minute spa treatments in SiSpa, a complimentary champagne toast, waived event space rental, and a complimentary one–night stay in an Ocean View Guestroom on the couple's first anniversary. The second package, for $15,000 bookings, includes a two–night complimentary Oceanfront Bridal Suite, two 50–minute spa treatments in SiSpa, a complimentary champagne toast, waived event space rental, a buffet breakfast for the bride and groom along with eight guests, plus a complimentary one–night stay in an Ocean View Guestroom on the couple's first anniversary. The resort offers outstanding catering capabilities to enhance weddings, galas and parties and boasts over 7,000 square feet of modern and unique event space. Talented wedding planners perfect each and every one of the details of the couple's day, while stunning views of the Atlantic Ocean greet guests. All of the region's most popular area attractions and activities are effortlessly within reach, so each and every guest can take their time to explore the South Florida sights. For more information or to book your wedding venue, visit the Marriott Pompano Beach Resort online, call 954.782.0100 X5012, or e–mail alexis.wells@marriott.com. The Fort Lauderdale Marriott Pompano Beach Resort & Spa offers the simplicity of beachfront living along with all the creature comforts seasoned travelers have come to expect. Spacious guest rooms and suites outfitted with private balconies provide sweeping views of the Atlantic Ocean. Elegant dining options, a selection of sparkling swimming pools, easy access to water sports, and fishing charters complete the package. The hotel is also conveniently located near many local businesses including Microsoft's Latin American Headquarters and Citrix Headquarters. The Fort Lauderdale Marriott Pompano Beach Resort & Spa's unique blend of beachfront sophistication, luxuriously appointed amenities, and thoughtful service render it a charming hideaway by the sands. 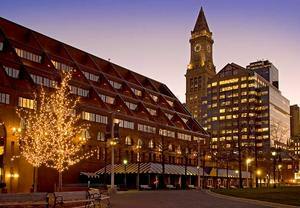 BOSTON, MA—(Marketwired – Dec 12, 2014) – The holidays are here, and Boston Marriott Long Wharf is ringing in the season with a special gift for travelers looking to celebrate in the city. Timed to coincide with the upcoming calendar of holiday events at Faneuil Hall, the hotel is granting a $25 credit with its Holiday Gift to You package. Other holiday hotel offers include a Dinner and Parking package, Pride and Joy Couple's package and Freedom Trail offer. Located directly across the street from the property, Faneuil Hall is one of the most popular holiday destinations in Boston, and this year it's ringing in the season with what are sure to be some unforgettable celebrations. Throughout December, travelers are invited to take in the Holiday Lights Tour, which takes guests around Boston for a sing–a–long on an Upper Deck Trolley. The tour brings guests back to Faneuil Hall just in time for the venue's spectacular light and sound show, Blink!, featuring the music of the Holiday Pops. Guests can also grab photo ops with Santa or get their holiday gifts wrapped, courtesy of Globe Santa. Faneuil Hall brings it all home with a special New Year's Eve event called The Ice, featuring a collection of interactive, family–friendly ice sculptures complemented by live street theater performances from December 30 – January 2, 2015, as part of the 2015 First Night Boston festivities. Boston Marriott Long Wharf invites guests to save throughout the season with its Holiday Gift to You package, which includes a $25 credit to the hotel. Guests looking for more ways to save can book the Dinner and Parking package which includes a $25 dining credit to Waterline Restaurant, plus parking, or the Pride and Joy Couple's package which includes a breakfast buffet for two and champagne delivered to your room. Those looking for a little adventure can book the Freedom Trail package, which includes breakfast for the whole family, plus tickets to the Freedom Trail tour. For more information on each of the exclusive deals, visit the hotel's website or visit faneuilhallmarketplace.com to view a list of this year's upcoming events. With exceptional waterfront views and stylish, spacious rooms and suites, the Boston Marriott Long Wharf is the ideal destination for a weekend getaway or family vacation. Impeccably appointed rooms and suites offer luxury bedding, 37–inch flat–screen TVs, and high–speed Internet access. Stunning views and seasonal New England cuisine await visitors at Waterline. For explorers, the hotel offers an historic Long Wharf location, within walking distance of Faneuil Hall Marketplace, Quincy Market and the New England Aquarium. Built in 1742, Faneuil Hall is a marketplace, meeting hall and site of American Revolution speeches. Corporate travelers will appreciate the hotel's proximity to Boston's financial district, as well as its business amenities, including 20,000 square feet of meeting space and full–service catering and event planning. NEW ORLEANS, LA—(Marketwired – Dec 12, 2014) – Cinderella may have had to rely on a fairy godmother to arrive at the ball, but today's Mardi Gras revelers have only to stay at the right hotel. Not only does the New Orleans Downtown Marriott at the Convention Center afford a convenient location near the parades, but its complimentary shuttle service to several balls makes it a top choice among hotels in downtown New Orleans. Mardi Gras is officially on February 17, 2015, but the festivities kick off well before then with parades starting as early as January 31. Most celebrants, however, will arrive for an extended weekend right before Mardi Gras, which is just in time to attend the Krewe of Bacchus Ball on February 15 and/or the Krewe of Orpheus Ball (also known as the Orpheuscapade) on February 16. Travelers exploring hotels near New Orleans' French Quarter will appreciate this property's historic building, riverfront location and luxuriously appointed rooms. But for those planning to attend the Bacchus and Orpheus Balls, the hotel is downright ideal, thanks to its complimentary shuttle service to and from both black–tie events. The Krewe of Bacchus Ball recently appointed John C. Reilly as this year's king, while the Orpheuscapade will entertain celebrants with Dierks Bentley and Casey James at the Morial Convention Center. Each event attracts thousands of locals and visitors with entertainment, food and, of course, plenty of drinks. And with a themed parade preceding each ball, the fun begins in the early evening and continues until the early hours of the next morning. When guests book a room at this downtown New Orleans hotel, they experience the highlights of the festivities. Not only does the shuttle service save them the trouble of schlepping back and forth in heels and tuxes, but the hotel's address puts them close by the parade routes. And with a range of hotel rooms available, many with views of downtown New Orleans and all with luxurious bedding to sleep off the good times, guests will look forward to going home as much as going out. Rates during Mardi Gras range from $379 to $599 per night, and travelers are encouraged to book now for the best availability. 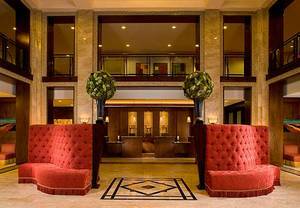 History and modernity unite in the New Orleans Downtown Marriott at the Convention Center. What was once a 19th–century cotton mill now serves as this stunning, 331–guest room hotel where visitors enjoy exceptional Creole cuisine at Wolfe's, coffee at Starbucks and an outdoor pool and fitness center. More than 25,000 square feet of flexible event space complements the services of the nearby Convention Center, as does the hotel's business center. And the more than 300 guest rooms and suites pamper visitors with flat–screen televisions, high–speed Internet access, safes and plush bathrobes. (A Concierge Level with additional indulgences is also available.) While the amenities are numerous, the hotel positions guests to enjoy the best of The Big Easy. Its riverfront location puts the French Quarter and Bourbon Street within walking distance as well as countless other attractions. AMELIA ISLAND, FL—(Marketwired – Dec 12, 2014) – Those looking for a holiday getaway may find their answer in Amelia Island, Florida, where average December temperatures are in the 60s and new local tours and businesses have created fresh ways to spread holiday cheer with visitors. The Residence Inn Amelia Island, voted as the 2013 Chamber of Commerce's Large Business of the Year and ranked as the #1 hotel on the island on TripAdvisor, adds to the fun with newly–constructed Gingerbread Lane, a 3–part Christmas Village featuring a “Pause with Mr. Claus,” “Holly Jolly Diner,” and “Santa's Construction Junction.” The first is a replica of Santa's den, furnished with a big red chair that the man himself will use during his December visits. The Holly Jolly Diner is a festive dining area decorated with a gingerbread house–inspired exterior. Santa's Construction Junction is a kids' dream workshop, with all kinds of crafts to create, stationary and mailbox for writing letters to Santa, and holiday–themed coloring books! Gingerbread Lane is the shining star of the hotel's holiday–themed lobby, complete with beloved Christmas tree, fireplace, Holiday Village decorative houses, and more. In keeping with the fun, the Amelia Island hotel has created new packages for those looking for a memorable moment this season. Families will enjoy “Together for the Holidays,” which includes Ghirardelli Peppermint Bark, Hot Chocolate Spoons created by the property's catering team, and their choice of either a $50 Visa Gift Card or 2 adult tickets to a private horse–drawn carriage ride through historic Fernandina Beach. ”Mistletoe Wishes” invites couples to cozy up with a $25 Dining Voucher, Hot Chocolate Spoons, and their choice of creating best–selling chocolate–covered popcorn, a wine–and–chocolate pairing, or chocolate martinis at the local Peterbrooke Chocolatier, 2 tickets to a private horse–drawn carriage ride through historic Fernandina, or 2 tickets to the island's newest foodie craze: a 2–hour Mixology Tour with Amelia Island Tasting Tours! The Fernandina Beach hotel also offers the lighter “Season's Greetings,” which features an arrival gift of Hot Chocolate Spoons and Ghirardelli Peppermint Bark. Amelia Island is bursting with holiday events for all ages, including the return of the famed S.S. Amelia Gingerbread Pirate Ship at nearby Ritz–Carlton, the Holiday Home Tour, Holiday Cookie Tour, the Lighted Christmas Tour, and several choral events throughout December. With everything on the island within a 20–minute drive, the holidays are easy on Amelia! The Residence Inn Amelia Island is located just 20 minutes off of I–95 and 30 minutes north of the Jacksonville International Airport (JAX). The Marriott award–winning property features spacious studio, one–, and two–bedroom suites with full kitchens and separate living and sleeping areas. Relax and reconnect by the cozy firepit on Tides Terrace. Explore the onsite entrance to Egans Creek Greenway, part of the Great Florida Birding Trail. Rent bikes at the front desk and head to nearby Fort Clinch State Park, or walk to the beach just 2.5 blocks away! Full hot complimentary breakfasts feature a new! Iced coffee bar and are the perfect way to start your day off right. Our free island shuttle can take you anywhere on the island and pick you up from 9am – 9pm. Designated pet–friendly suites offer furry family members a chance to vacation with their loved ones as well (call for pet policy information). 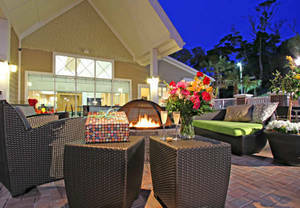 The Residence Inn is Amelia Island's Treasure — Discover Us! Forward Industries, Inc. (NASDAQ: FORD) today requested that shareholders review its proxy statement for the 2014 Annual Meeting of Shareholders recently mailed to shareholders. Forward also issued the following letter to shareholders addressing the competing proxy campaign launched by Terence Bernard Wise and its corresponding lack of vision for the Company. Since June 2014, director and shareholder Terence Bernard Wise has issued repeated public attacks against our Chairman, other directors, and management. Mr. Wise's inflammatory comments and proxy campaign to obtain full representation on the Board at the upcoming Annual Meeting threaten to erode value for all shareholders that the current Board has been working hard to preserve and grow. Mr. Wise is not seeking a minority position on the Board. He is looking to overthrow the Board in its entirety, we believe, in order to preserve his own interests. He has no public–company board experience outside Forward and all of his previous business experience relates to managing privately–held ventures. Mr. Wise continues to disparage our Board's motives and integrity, but we question his motivation given his clear conflict of interest: his exclusive sourcing contract with the Company, which we believe he is working to preserve and enhance. That contract has generated fees to Mr. Wise and Ms. Yu of over $3.0 million since March 2012 — more than the entire EBITDA of the business during that period and, notably, the value of his investment in the Company. The economic benefit to them of controlling this business and gradually increasing the fees they pay themselves, much as they sought to do during the contract renewal this past March, we believe to be their primary, though never acknowledged, motivation. Significant shareholders have also expressed serious concerns about the obvious conflicts created by the Company's largest shareholder also being the Company's largest vendor. If Mr. Wise is successful in electing his alternative slate and his hand–picked designees follow Mr. Wise's lead in making Board decisions, subject to their fiduciary duties, Mr. Wise would effectively control your company and do as he pleases on his exclusive sourcing contract. Shareholders should question whether Mr. Wise's lucrative sourcing contract means more to him than working for the benefit of all shareholders. After all, he has repeatedly declined overtures to pay a full and fair price for your Company. Since the current management team took over in 2012, our primary objective has been to grow our business organically and through strategic acquisition. During fiscal 2013, we achieved important milestones, including growing sales to more than $30 million from $22 million in fiscal 2011 and returning the Company to profitability for the first time since fiscal 2006. Mr. Wise's proxy campaign has impeded the momentum the current Board and management has built to improve performance and build shareholder value. Despite self–serving assertions by Mr. Wise, we believe the Company is poised to grow, capture additional market share through acquisitions and create value for our shareholders. Mr. Wise's bitter comments and damaging actions have forced hundreds of thousands of your Company's dollars to have been spent on professional fees. Mr. Wise's actions have also restricted our access to capital markets as we sought to execute a transformative acquisition: the Board and management team had initiated transaction negotiations before Mr. Wise launched his proxy campaign and pursued it to help diversify our revenue base and substantially increase cash flow per share. Unfortunately, Mr. Wise's constant interference impeded the deal. Do not allow Mr. Wise to continue to derail our efforts to maximize shareholder value and the strong momentum we have built. Your Board and management have tried to work with Mr. Wise to better understand his concerns: in fact, we discussed whether Mr. Wise would be prepared to buy the Company at an appropriate premium — and he refused. He then expanded his expensive and distracting litigation, to the detriment of shareholders. We believe this shows that Mr. Wise has little regard for creating value for fellow shareholders. WHAT EVER HAPPENED TO MR. WISE'S PURPORTED VISION AND ACTION PLAN TO IMPROVE SHAREHOLDER VALUE? Earlier this month, your Board and management team communicated a clear and viable plan for continuing to build shareholder value as well as our effort to enter into a transformative acquisition that, if successful, could have doubled revenue and quintupled EBITDA on a current pro forma per share basis. Even now, less than 20 days before the Annual Meeting, Mr. Wise has offered no strategic plan for Forward — only promises that he will tell shareholders his vision for the Company at some future date, including a so–called “90 day plan.” Mr. Wise has not even identified a potential new CEO or CFO or other executives for the current management team he seeks to replace. We believe the primary issue is which director slate is more qualified and can exercise the best independent judgment for the benefit of all shareholders. With no publicly stated vision or alternative management team, voting for Mr. Wise's slate presents great uncertainty for the future of Forward. Our Board and management have sought qualified and credible additions to our team who will support the growth we seek. It is worth considering the type of people that Mr. Wise has supported for board membership at Forward in the past to judge what he might urge his fellow, hand–picked, directors to do in the future. Mr. Wise repeatedly tried to nominate his long–time business partner Jenny Yu for Board membership. The Board granted Ms. Yu observer status as a courtesy. Despite being told about Company insider trading rules and how they applied to her, Ms. Yu improperly acquired Forward stock while in possession of material non–public information about the Company. This was especially troubling given her role as Managing Director of the Company's exclusive sourcing vendor. In order to prevent further misconduct, we barred Ms. Yu from attending future Board meetings. We do not believe Mr. Wise is qualified to designate an entirely new director slate. He has no public–company board experience outside Forward. He has a clear conflict of interest as a result of his lucrative sourcing arrangement with Forward. His prior proposed nominee — Ms. Yu — acquired Forward stock while in possession of material non–public information and was deemed by a majority of the Board to be unqualified to serve as a director. We do not believe Mr. Wise is working in the best interests of the Company and its shareholders. He, in our view, is seeking to protect his exclusive sourcing contract, despite investor calls against this related party arrangement and the clear conflict of interest it presents. His sourcing contract (approximately $1.5 million a year) exceeds that of the Company's EBITDA and represents an effective annual dividend to him that almost exceeds his investment in shares of the Company. His frequent and repeated public attacks, as well as litigation he has filed against the Company, have obstructed attempts by your Board and management to build shareholder value. Mr. Wise has not publicly shared any vision or action plan to maximize shareholder value. He has never publicly articulated a plan to build shareholder value despite repeated promises that he will share his vision for the Company, including a so–called “90 day plan,” prior to the Annual Meeting. He seeks to replace members of senior management, including our CEO Robert Garrett, but has not publicly identified any alternative executive officers. Your Board and management offer a strong strategy for building shareholder value. We have the right people with the right expertise in place to make this happen. We are absolutely committed to maximizing shareholder value. For the purposes of the upcoming Annual Meeting to be held on December 30, 2014, we urge you to look at the facts — not the rhetoric — and vote the WHITE proxy card for our slate of nominees. Incorporated in 1962, and headquartered in West Palm Beach, Fla., Forward Industries is a global designer and distributor of mobile device cases and accessories. Forward Industries' products can be viewed online at www.forwardindustries.com. In addition to the historical information contained herein, this press release contains certain “forward–looking statements” within the meaning of Section 27A of the Securities Act of 1933, as amended, and Section 21E of the Securities Exchange Act of 1934, as amended, that reflect the Company's current expectations and projections about its future results, performance, prospects and opportunities. The Company has tried to identify these forward–looking statements by using words such as “may,” “should,” “expect,” “hope,” “anticipate,” “believe,” “intend,” “plan,” “estimate” and similar expressions. These forward–looking statements are based on information currently available to the Company and are subject to a number of risks, uncertainties and other factors that could cause its actual results, performance, prospects or opportunities to differ materially from those expressed in, or implied by, these forward–looking statements. No assurance can be given that the actual results will be consistent with the forward–looking statements. Investors should read carefully the factors described in the “Risk Factors” section of the Company's filings with the SEC, including the Company's Form 10–K for the year ended September 30, 2014 for information regarding risk factors that could affect the Company's results. Except as otherwise required by Federal securities laws, the Company undertakes no obligation to publicly update or revise any forward–looking statements, whether as a result of new information, future events, changed circumstances or any other reason. BOULDER, COLORADO—(Marketwired – Dec 12, 2014) – As originally announced in a press release issued on November 25, 2014, Ecrypt Technologies (“Ecrypt” or the “Company”) (OTCQB:ECRY) a Colorado corporation, has been made aware of a significant increase in the share price and trading volume of the Company's shares beginning Friday November 21, 2014. The Company's management team has developed a detailed business plan and is focused on executing that plan. While management believes that it will be successful in implementing this plan, it does not in any way support the notion that the Company's product offerings (or its expected revenues) will yield “super” or hyper–growth sales at levels postulated by these overly aggressive and optimistic promotional campaigns. The Company has not, directly or indirectly (including payment of a third party), been involved with the creation or distribution of the spam or promotional emails related to Ecrypt and its securities, and based upon information available to the Company after reasonable investigation, the Company believes that none of its officers, directors or controlling shareholders, have personally been directly or indirectly involved. Additionally, based upon information available to the Company after reasonable investigation, the Company believes that none of its officers, directors or controlling shareholders, have sold or purchased any of the Company's securities since November 21, 2014, the first known instance of the promotional campaign. On July 9, 2014 the Company commenced a non–general solicitation private placement offering under Regulation S. As part of the ongoing non–general solicitation private placement offering, the Company did sell 230,000 shares of common stock, and received subscriptions for an additional 220,000 shares of common stock, between November 21, 2014 and December 12, 2014. Shares issued as a result of these transactions are classified as “restricted securities,” as defined in Rule 144 under the Securities Act, and cannot be traded on the open market for a period of one (1) year. The Company has been contacted by the British Columbia Securities Commission (BCSC), the Financial Industry Regulatory Authority (FINRA), the U.S. Securities and Exchange Commission (SEC), and OTC Markets Group, Inc., regarding the promotional campaign, and has supplied available information to each of these organizations and regulatory agencies. The Company and its officers and directors have, and will continue to, cooperate fully with each of these organizations and regulatory agencies, and will continue to provide them with additional information as it becomes available. Any investor interested in the Company should review its filings with the SEC on EDGAR (US) or the BCSC on SEDAR (Canada). Ecrypt Technologies, Inc. is at the forefront of data security, specializing in military–strength information security solutions for enterprise, government and military. Ecrypt empowers organizations with the freedom to communicate and collaborate without risk of liability, reputation damage, competitive threat and other negative outcomes. Ecrypt is the trusted first choice for those looking to keep their communications confidential. For more information, visit http://ecryptinc.com. This press release contains certain “forward–looking statements,” as defined in the United States Private Securities Litigation Reform Act of 1995, that involve a number of risks and uncertainties. There can be no assurance that such statements will prove to be accurate and the actual results and future events could differ materially from management's current expectations. The economic, competitive, governmental, technological and other factors identified in the Company's previous filings with the Securities and Exchange Commission may cause actual results or events to differ materially from those described in the forward looking statements in this press release. The Company undertakes no obligation to publicly update or revise any forward–looking statements, whether as a result of new information, future events or otherwise.